To develop your patios and better-to-sit outdoors, really demands for lot of time, struggle and money! So it is becoming all difficult to organize the outdoors better for average income group! 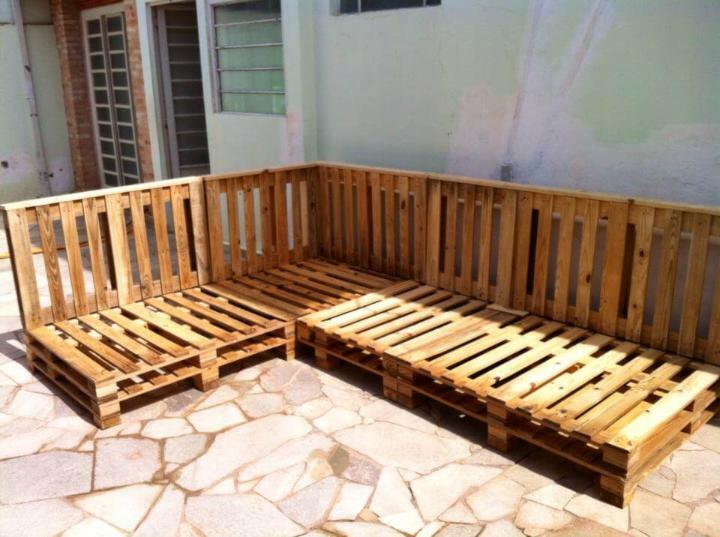 Help yourself with all fantastic DIY solution, if better outdoor sitting set is first in your need-list then own this pallet sectional patio sofa which is a pure pallet-wood creation and has been done using complete and whole pallet skids, some of them trimmed down as per demands of better construction and better fittings! 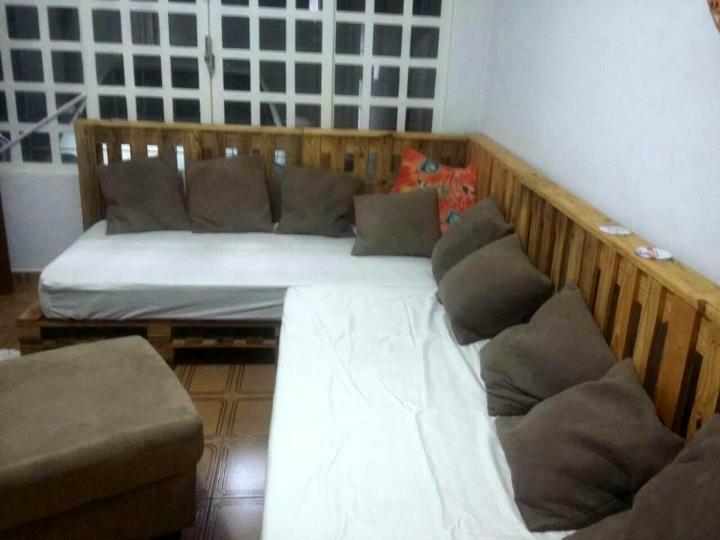 Construction work all about creative vertical and flat arrangements of pallet boards, stack them as flat wooden skids for installation of berth position and just align them vertically across the L-shape boundary of couch frame for stable backrest positions! Install legs also or more layers of pallets to raise it more to a decided height level or that suits your space best and just go with caster wheels if you want a super easy dragging and pushing of it! 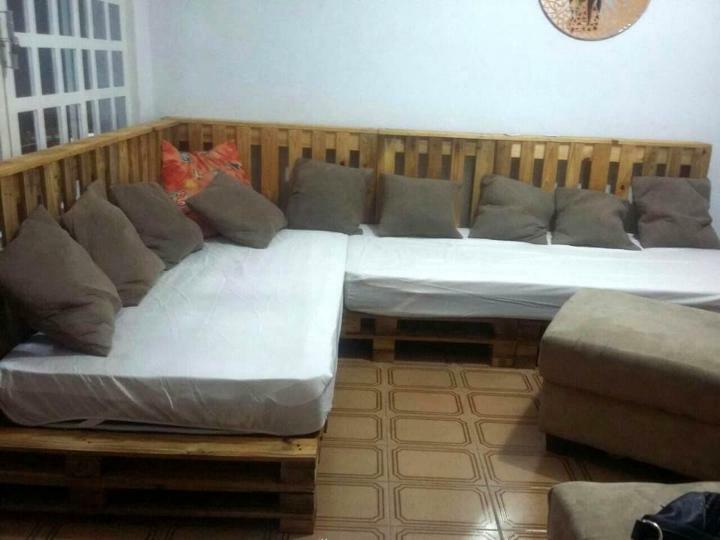 Need to copy this amazing couch frame? Just go ahead with robust wooden pallet boards in hands, floor them up up to two layers and install heavy duty berths! Let the more pallet boards come vertical against the wall along the boundary of berth frame, this will give your the better backrest position on which some of your items can also be placed! Final step is to provide peak value comfort to whole pallet-made sofa frame, select the mattress with high foam density to replace the wooden stiffness with soft feel of comfort! Do go for a pillow throw that just double up the fun and raise also the luxurious value along with beautiful appeal!